HTTP/2 only work with mod_worker or mod_event. if you use other mpm modulesm you need to swith to worker or event. 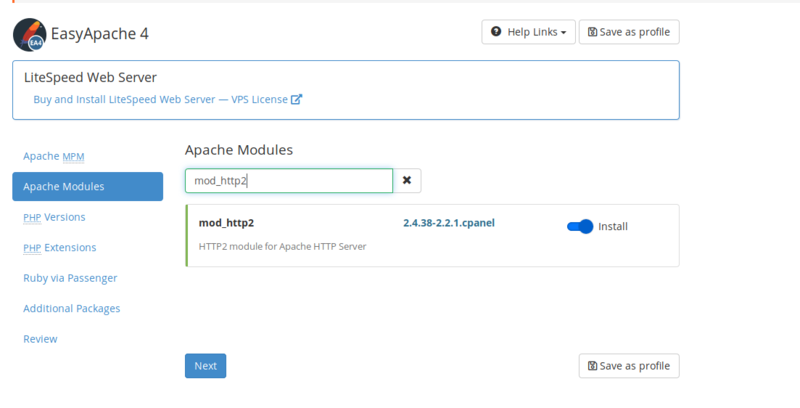 Now under Apache Modules, search for “http2”. Use the selector on right side to install it. Click “Next” until it it reach provision page. Click “Provision”. Most browsers only support HTTP2 over SSL, so make sure you have SSL (https://) enabled. 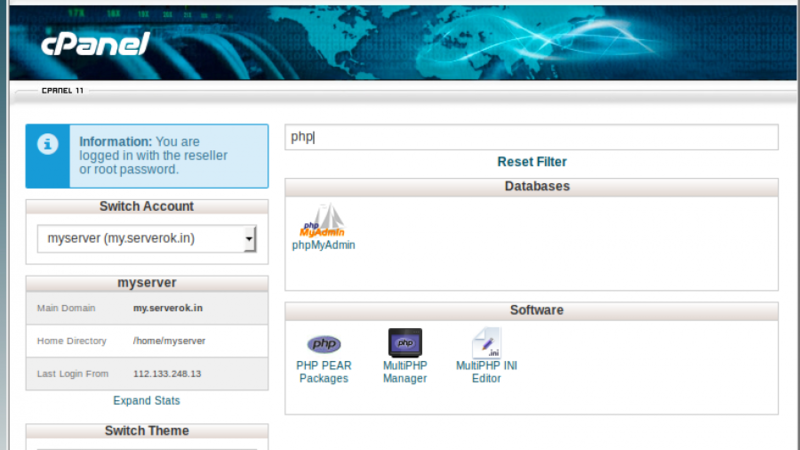 On WHM, phpMyAdmin was missing from left menu after Cpanel upgrade. 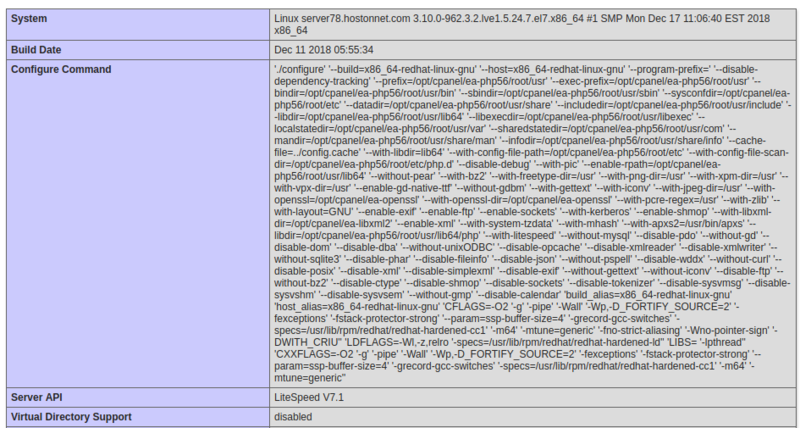 Verify cpanel-phpmyadmin package insalled on the server. After clearning browser cahce, phpMyAdmin started showing in WHM. ImunifyAV is a free Antivirus for Cpanel servers by CloudLinux. This will instal 15 day TRAIl version of the LiteSpeed Web Server. Once you purchased license, you will be able to update license key in WHM. You can also do this in WHM. 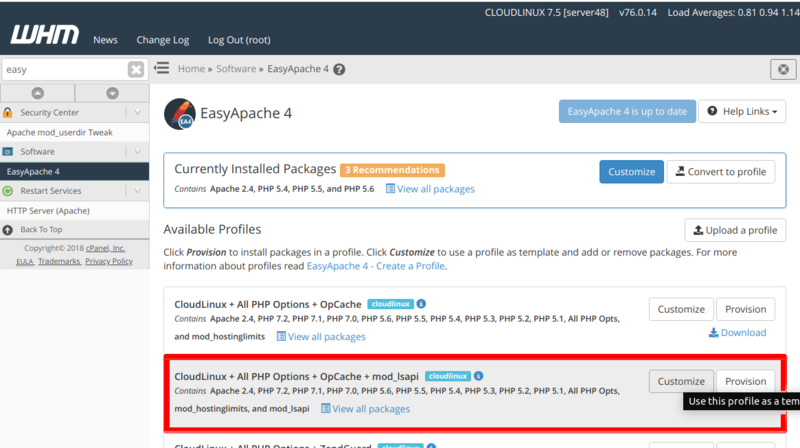 CloudLinux provides high performance PHP module lsapi. It is a replacement for suphp available on cpanel servers. lsapi module is a based on LiteSpeed Technologies API for PHP. Click “Provision” and wait until the software is updated. 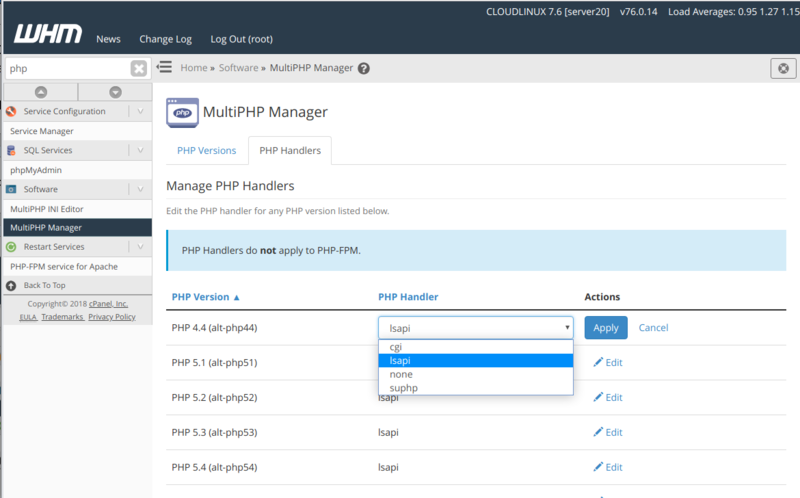 On Next page, you can set handler for each PHP versions. Once you run it, all PHP version handlers will get chanegd to lsapi. If you check PHP info, you will see Server API listed as LiteSpeed. Many server providers setup server with smaller / partition like 20 GB. This is fine for normal Linux Servers, you will need more disk space on Cpanel Servers. Many use CloudLinux on Cpanel Servers, this will require you to have more free disk space on / partition. I don’t create seperate partition for /usr and /var as this will use up more space, may end up one of the partition get filled up while other have lot of free space. Having one partition for /, you don’t need to worry much. / = All of the disk. On a cpanel server, PHP scripts can’t sent email. Incoming and outgoing emails for email users (mailbox) are working properly. To debug, loggged in to SSH as one of the cpanel user. If SSH access is not enabled, enable SSH in WHM. Once logged in, verify sendmail works. I get above error message. This is because permission error with /usr/sbin/sendmail. phpSHIELD is an encoder that encode PHP scripts so no one can read your source code. They actually resell SourceGuardian Encoder, so you can install Sourceguardian loaders. Cpanel Servers come with sourceguardian loader, to install follow the instructions here.